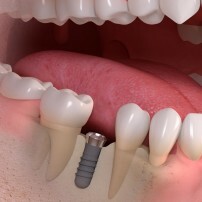 Implants withstand greater chewing forces than dentures, can prevent bone loss in the jaw and maintain gum tissue, prevent the appearance of hollow or collapsed cheeks that can occur after multiple tooth extractions, are permanently fixed in the jaws and like natural teeth are cleaned by dental floss and brushing with toothpaste. Before implant surgery is commence your dentist will make sure you are a suitable candidate for the procedure. Factors such as age, significant bone loss, a history of smoking, gum disease and certain medical conditions increase the risk of complications. A full dental examination, x-ray radiographs, CT scans of your teeth and jaws as well as dental casts of your mouth may also be required with planning for an implant. Implants are commonly made from titanium which is capable of integration with the surrounding bone structure. After the surrounding area has been numbed with anaesthetic your dentist prepares a site in the gum to expose the bone underneath. Special surgical drills are used to prepare a hole in the bone in which the implant can be placed. The position and number of implants which are placed is limited by the space and amount of bone available at each site. The implant is carefully screwed into the previously prepared drill hole until is securely located in position. The gum is stitched closed around the implant to cover the wound and ensure good healing, after 7 to 10 days they are removed. It will take weeks and months for the stability of the implant to improve as bone grows onto the implant surface, this process is called “osseointegration”. Once the implant has been tested to confirm successful osseointegration with the surrounding bone, then it can be restored with an abutment and crown. 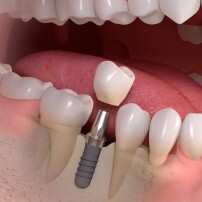 An impression of the implant and teeth is used to create the design of the artificial crown which will fit your mouth. The crown can be fixed to the implant/abutment with a screw or by cement depending the implant orientation and position. A dental x-ray radiograph may be taken to confirm the correct placement of all the implant components. Risks associated with implant treatment are; damage to adjacent anatomical structures such as the sinus or a nerve, damage to nearby teeth, local or systemic infections, the implant may fail to osseointegrate with the bone and the abutment/crown may loosen over time. Visit Straumann to learn more.